First of all I should say that I wasn't overly pleased with these when they arrived...but I've subsequently changed my mind, so I thought I would share my thoughts on these winter warmers. Sugoi is a relatively new brand to the UK cycling market - a Canadian brand, who have come into the limelight in Europe through their sponsorship of Peter Sagan's Cannondale Liquigas Team. They seem to have a bit more work to do on their marketing though. Firstly, there is a distinct lack of reviews for this product out on the web, it took me a good bit of browsing of American bloggers' sites before I was convinced they would be a good choice. Secondly, the product photography is rather misleading; the picture to the right essentially shows the product incorrectly worn (in my opinion), as the branded stretchy panel is in fact designed to be worn on the back of the leg (as shown in the photo below). Aside from their marketing...Sugoi seem to produce some quality kit. 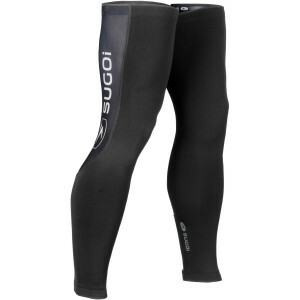 The high-weave DWR Lycra on the front and sides of the leg warmers is a high density material, which is water and wind resistant, whilst also being flexible and soft (a little like SoftShell material). I've been out in some torrential rain, and some very cold temperatures with these on, and my legs have stayed warm and dry. The panel with the Sugoi branding on is made of normal (lighter) Lycra material, this is placed on the back of the leg where the weather doesn't reach; allowing for greater flexibility, and a certain element of venting to stop over-heating. It took me a while to get the panel in the right position; as you can see in the photo below, there is contoured stitching surrounding the panel; this proved a bit of irritation on the back of the knee when I first started wearing these, but I have subsequently found that I was wearing them too high on the leg; The stitching widens as you progress upwards, so by moving the warmers down, it is no longer on the joints where it was causing irritation. The contoured stitching and the stretchy panel does work wonders for the fit of these warmers though; there is absolutely no bunching around the knee joint, and the zippers mean there is no excess material, even around my skinny calves and ankles. There are good grippers on the ankles and the thighs, which seem to hold these warmers solidly in place, I haven't had the slightest bit of slippage from them, which compared to a few embarrassing experiences with my previous Altura leg warmers is a major improvement! Overall these seem like a good set of warmers; comparable to the Gore WindStopper set; they offer a similar level of warmth and weather-resistance, for a significantly lower price (I picked these up for £26). They take a bit of getting used to, particularly with the seams; but I think through a bit of trial and error (and probably a bit of softening after multiple washes) the problem has completely subsided. Well worth thinking about getting a pair to keep those vital leg muscles and knee joints warm and functioning properly in the cold and wet. Something a bit different from the norm as well. I think I'm a bit late asking this, but are the logos reflective on these? Hi nicko, no the large logos on the back of the legs aren't, but the smaller logos on the side of the legs are.